Don't settle for a "wireless gateway"
A "wireless gateway" is an all-in-one device that combines a modem (cable or DSL) with a wireless router. They tend to be mediocre, poor performers, especially those supplied by Internet providers. Insist on a pure modem. Buy your own separate wireless router. Make sure the modem is configured in "bridge" (not routing) mode. Otherwise you can have "double NAT" problems. The low 2.4 GHz band, commonly found in consumer-grade devices, is increasingly crowded, which can severely limit performance. The high 5 GHz band tends to be much less crowded, and will often provide much better performance. But don't just get a single band 5 GHz device, since some wireless devices only support 2.4 GHz, and avoid dual band devices with a single radio that can only work on one band at a time. In other words, not just dual band, but simultaneous dual band. The current baseline for good Wi-Fi is AC1750 (Wi-Fi 5), 450 Mbps on the 2.4 GHz band plus 1300 Mbps on the 5GHz band. AC1900 and up can provide improved range and speed, but may not be needed in many cases. Although Fast (100 Mbps) Ethernet is comparable in real world performance to 300 Mbps wireless (actual wireless performance is usually much less than the advertised maximum), Gigabit (1000 Mbps) Ethernet provides much faster wired networking for not much more money and is otherwise good "future proofing". A guest feature is a separate wireless network for guests that lets them connect to the Internet but not to any of your own networked devices. It's a bad idea to give guests access to your own network. USB can be used to attach USB storage or USB printer to the wireless router for network access. Best. AC2900. Outstanding range and performance. High processing power for gigabit throughput. Excellent support. Very good. AC1750. B1 is improved over original version. All that most people need. Best Buy. AC1750. All that most people need. Check the support website for updated firmware before installing, and regularly thereafter (e.g., quarterly). A cheap wireless router can reduce performance due to poor internal routing speed. Identity theft is just one of the risks from getting hacked, and WEP "security" is essentially useless. Use a different (and equally strong) password for a Guest network. Use a random combination of 12 or more mixed case letters and numbers that you don't use for anything else, and do not use common words, names, numbers, etc. Network name (SSID) hiding and MAC address filtering are too easily circumvented to provide even minimal security, and they can lead to network problems, so don't use them. Mesh wireless is all the current rage, but impairs wireless performance. 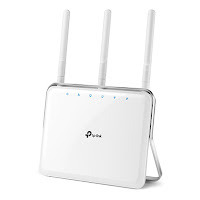 The better way to increase coverage is with wireless access points connected by Ethernet wiring, or by powerline networking where Ethernet is impractical. If mesh must be used, ASUS AiMesh can work well with a pair of wireless routers.